Sometimes the crush and bustle of Marrakech gets too overwhelming and we need to get out of the city. Most people that come to visit don’t know there are small towns and beautiful scenery only a short car ride away. Essaouaira is our favorite escape for the weekend but for a day trip, or even a partial day we like to head to the Ourika Valley. We think it’s a great idea to include day trips with you plan your travel to Marrakech. It can show you a completely different side of the country. MarocBaba and I drove to Ourika on a whim shortly after we arrived in Morocco. He hadn’t been there in years, and had never driven there but once in the area he knew where to go. I had never been. At most to get to the very end of the valley, Seti Fatima (the road literally goes no further) is an hour to an hour and a half depending on traffic and road conditions. Many people also travel this route to visit Oukaimeden is best known as a ski resort in winter (yes skiing in North Africa!). From Marrakech, the route is direct to the Atlas Mountains with a two-laned road taking you through the mountain passes. We so enjoyed our visit that we couldn’t wait to go back with our kids. Having spent many years in the Midwest United States we have really missed seeing green trees, water (lakes, rivers etc), and wide open spaces. Ourika has all of these and more. When we took off driving towards the mountains the kids could hardly believe we were really going to take a road through them. The Atlas are huge! Once we started driving they were really in awe of the landscapes and enormity around them. Coming from Marrakech, you will first arrive in the town of Ourika proper – which sadly – there isn’t much to see. Continue on the road towards Seti Fatima. You will begin to see road side stalls selling all kinds of things. We got an excellent deal on some rugs when we stopped at one! Once in Seti Fatima park and walk. There are bridges that look quite wobbly but are by in large quite well built crossing the river that runs through the valley. When we went it was September and the water levels were pretty low. But, this same river, that is fed by mountain run off, also caused a devastating flood in 1995 that killed nearly 100 people. 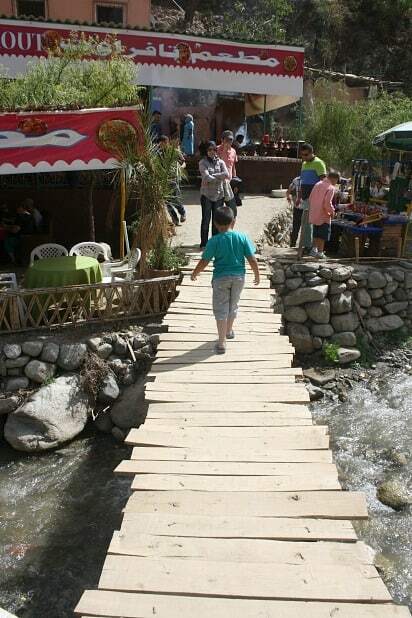 Crossing the river towards the mountains there are lots of restaurants and more famously the hiking paths that lead to the seven waterfalls of Ourika. We took the kids part of the way to the first waterfall. This is a path that is on the side of a mountain. There are no railings so please keep this in mind. If my kids were younger, I most likely would not have climbed this with them, however they did great! We saw several families with very little children (under 3 years old) climbing to the waterfall but this just seemed a little too dangerous for me. If you decide to go, make sure to wear very good foot wear and consider a talk with your kids before hiking. There are no real safety backups on the climb. Throughout the city you will find guides that offer to take you up the mountain. If you decide to do this, negotiate a rate with them BEFORE you start climbing so that there’s no surprise at the end. After climbing, we went back down to the bottom and the river so that the kids could play in the water. The water was very cold but they had fun playing and walking around in the water. I suggest bringing a change of clothes just in case. If you do walk to the first waterfall (it’s not advised that young children walk beyond the first waterfall), many kids have swim suits and swim in the pool of water at the bottom of the falls. If you think you might do this, be prepared with a towel and dry items. The real reason I keep going back to Ourika? The tajine. Seriously, to me it’s worth driving an hour just to eat the food. 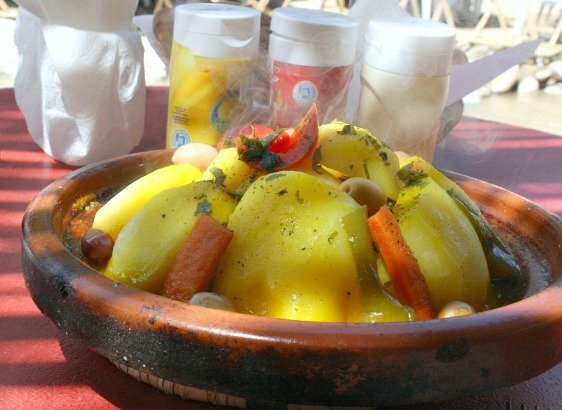 This is a beef tajine with carrots, potatoes, olives and spices. It’s cooked over coals and is simply delicious. It is served with fresh Berber bread and is simply to die for. It’s worth noting that the people of Ourika are Berber and you’re more likely to hear Tashelheit (a Berber language) spoken than Arabic or French. But as one of the shopkeepers told K, “I’m Berber we know every language of the world.” You’ll find this to be mostly true. Many of the agricultural products that arrive in Marrakech come from the Ourika valley. When we went these berries were just coming into season. They look like giant raspberries and are sold in small woven reed cones for a few dirham. 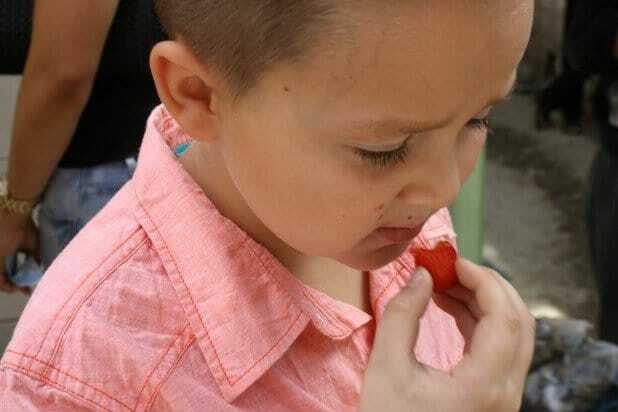 We weren’t particularly fond of them but it was something new to try. It was when we were buying apples, peaches, and quince that we discovered some of the older inhabitants of this valley ONLY speak Tashelheit, they don’t know how to speak Arabic. This was amazing to both of us, as we were less than 50 miles outside of Marrakech, one of Morocco’s biggest cities and this small region was by in large still isolated. It really made us wonder about more rural communities. If you’re visiting Marrakech and are looking for a nice escape from the heat and crush of the city you can’t go wrong with Ourika. Take your time and enjoy a different side of Morocco and I promise you’ll walk away with a completely new and different experience. From Marrakech there are many tour companies that run day excursions to Ourika. 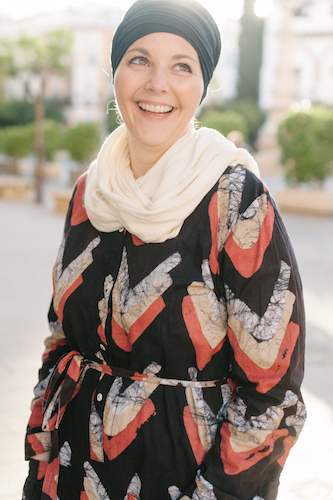 If staying in a riad or hotel, ask the concierge who they might recommend to go with. If you’re more of a “do it yourself” traveler, rental cars are easy to come by and the drive is quite simple with plenty of signage. There are also buses and grand taxis that run several times daily to the valley. Do you want access to years of insider knowledge to help make your trip to Marrakech memorable? Unsure where to start but want a helping hand along the way? Sign up and get access to insider information, bonuses and so much more. Marrakech is waiting for you! Success! Now check your email to confirm your on the list. I’m so glad that I stumbled across your website – it’s a treasure trove of info and tips, thank you. We’re visiting Marrakech for the first time at Easter with our four children aged from 9-22, staying in Tamesluht. As we have only a few days we will sadly only have time for one day trip. 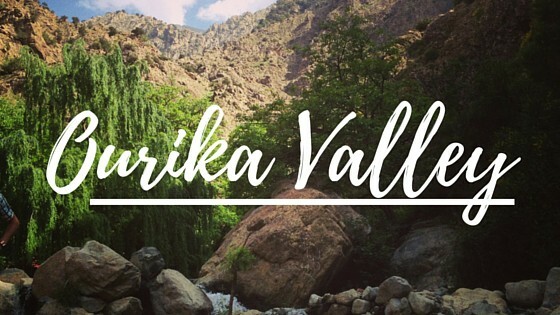 Would you advise that we visit The Ourika Valley and hike to the first waterfall, or visit Imlil and have lunch at Kasbah du Toubkal? I know it’s like comparing apples to oranges, but which have your family enjoyed most? Hi Elaine, You’ll already be quite a bit outside of the city so not sure you’ll want to do any day trips. Probably visiting the city instead? But if I had to choose I’d do Imlil. As you’ll be staying out of the city you may want to spend time in the city. If you were choosing between the two I’d pick Imlil. There are some waterfalls that you can easily walk to from Kasbah du Toubkal as well and it will be less crowded. I loved this post and made me remember my own trip to this wonderful place and the great berber tagine we had by the water 🙂 only in morocco!! Hope you are enjoying morocco.